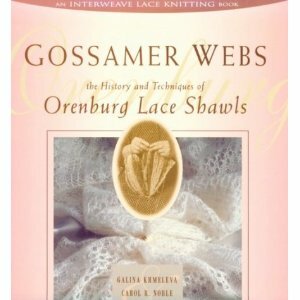 Gossamer Webs (or Orenbrug Lace) Shawls. To me, making one of these shawls would be the pinnacle of my knitting career. I have seen these in person at knitting conventions, and they are so light and delicate. Just a whisper of fabric, the detail is amazing. It is a bit mind boggling to attempt to knit one of these, and be able to detect any mistakes. I am thinking that this would be very difficult to rip back if needed. I have coveted the books for quite some time, and this question finally prompted me to purchase both. I need to do this project before my eyesight fails me for sure. For now I will dream, still have some time. Orenburg shawls are square or rectangular, and are made of knitted lace. The stitch patterns are usually geometric, and the diamond shape is quite popular. Sometimes there is a center design with different borders, and sometimes the same design is repeated over the entire shawl. 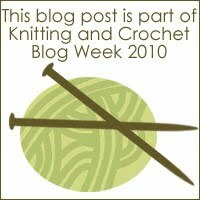 Some shawls, to save on costs, have machine-knitted centers which are usually done in plain stockinette stitch (knit stitches on one side and purl stitches on the other). Orenburg knitters today may follow a written or graphed pattern, but traditionally they worked from memory. As they designed new patterns they would pass them along to their daughters, granddaughters, and other knitters so that the patterns wouldn’t be lost. Shawls that are made from the finest (thinnest) yarn are knitted on extremely thin needles (sized 000–0), and usually weigh less than two ounces. They conform to the tradition of the “wedding ring shawl,” because the entire shawl is fine enough that it can be pulled through a wedding ring. There is also a slightly thicker yarn which produces a heavier, warmer shawl; for these shawls, needles size 1–2 are used. Originally all shawls were made in only one color, from natural-colored yarn (white, light gray, or dark gray). Eventually, though, the knitters began designing two- and even three-color patterns. And some shawls today are made from yarn that has been dyed. The process of shawl-knitting is tedious and time-consuming, but even after the knitting is finished there’s still work to be done. The shawl must be checked for remaining guard hairs and those hairs removed. And finally the shawl must be washed and its size set by blocking, either on a flat surface or a frame. Before blocking the shawl resembles nothing more than a crumpled-up ball of yarn; it is blocking that brings out the stitch patterns and reveals the true beauty of the entire piece. I found your post today very interesting. I learned something new. I love shawls too. Wow. WOW. Freakin’ amazing. You have a lot of guts to try this.